Total cost: $235 for raised bed with soil (bought in bulk; $290 with soil bought in bags). Prices may vary. You’ll build the bed upside down. 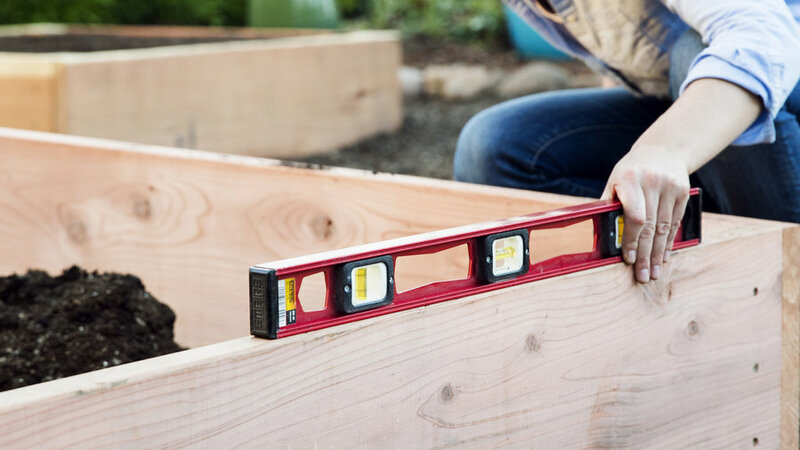 Working on a flat surface (such as a patio), set a 4-foot 2-by-12 board on its narrow side edge on the pavement; at one end of the board, place a 16-inch 4-by-4 corner post upright and flush with the end of the board. Use two adjustable woodworking clamps—or a buddy—to keep both pieces of wood flush on the sides and bottom. 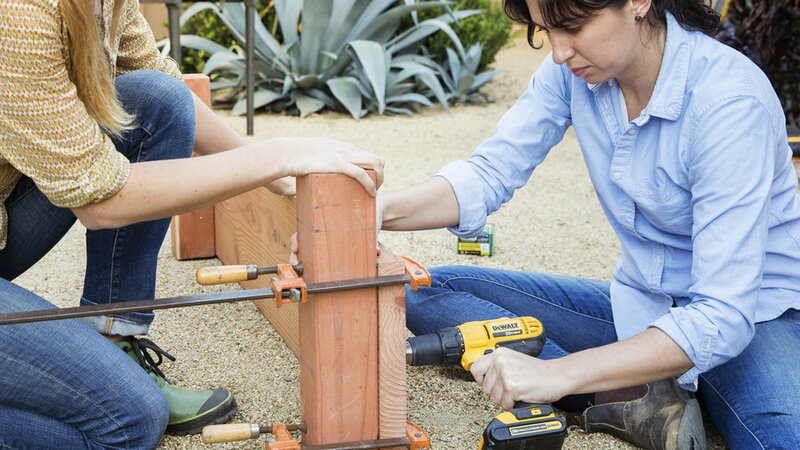 Now that you’ve got the previous step’s post-adding technique down, repeat that technique to attach a corner post to the other end of the 4-foot board. Then grab the remaining 4-foot board and attach a corner post to each end. 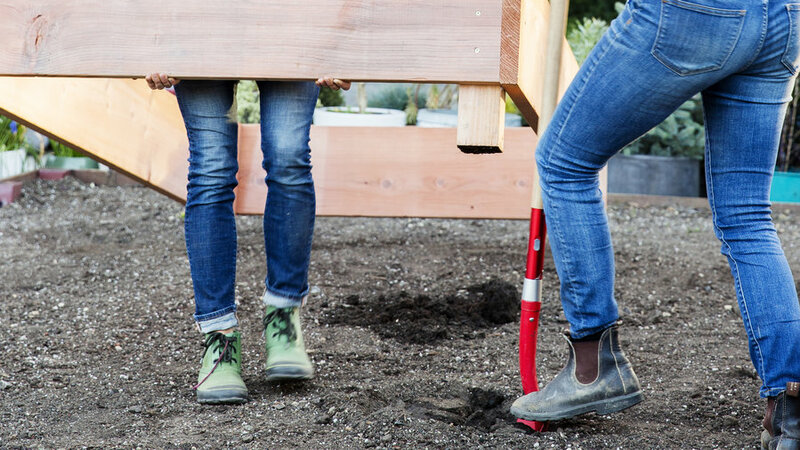 You now have the two 4-foot ends of your raised bed and are ready to attach the bed’s longer sides: Position the first of your 8-foot 2-by-12 side boards between your two 4-foot bed ends. 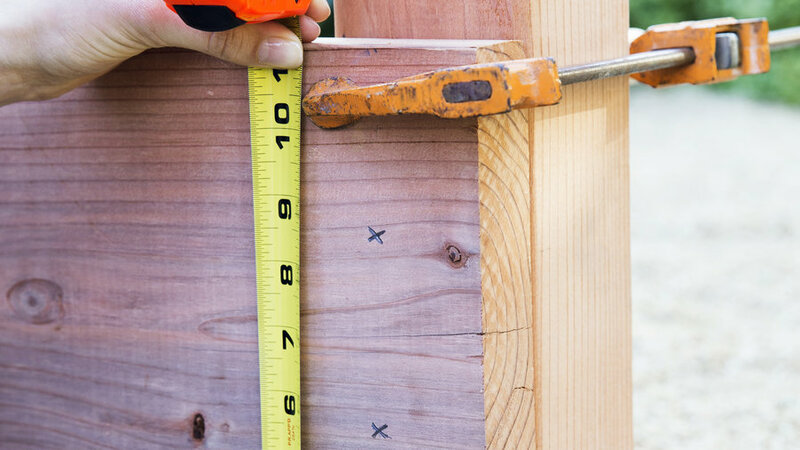 Make sure the 8-foot board is flush with each corner post (hold them steady with the woodworking clamps—or grab that buddy again), then predrill each board end with three holes and secure it to a post with three 3 1/2-inch screws. Repeat to attach the remaining 8-foot side board to the awaiting corner posts. Your rectangular bed is now complete! With help from a friend, flip the bed right side up and move it into position. If you plan on planting vegetables, choose a spot in your garden that receives full sun—meaning at least 6 hours of sun per day. A north-south orientation of the bed will give you even sun exposure. Once you’ve decided on a bed location, dig a 5- to 6-inch-deep hole for each of the corner posts. Then sink each post into the ground. Make sure the bed is level on all sides (using a level if you have one); this will ensure that irrigation percolates evenly. Then backfill the corner holes with dirt to steady the posts. 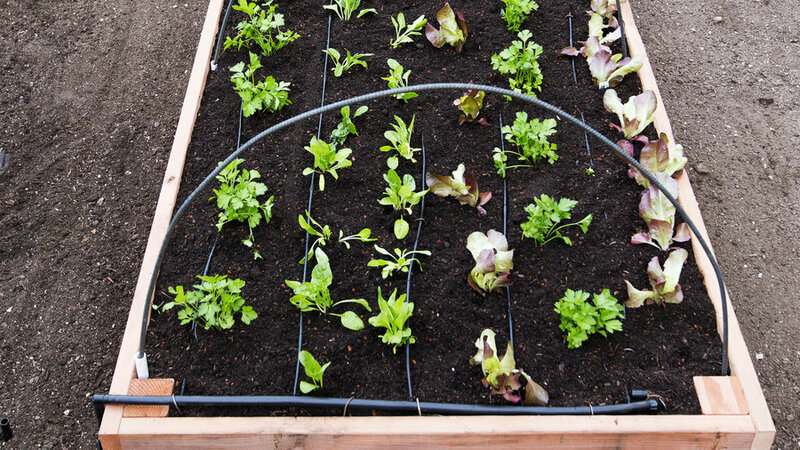 To give your vegetables an edge on birds and frost, consider adding hoops to hold up bird netting or a floating row cover. If you want to add these three optional hoops, attach their PVC support tubes now (before you fill up the bed with dirt). 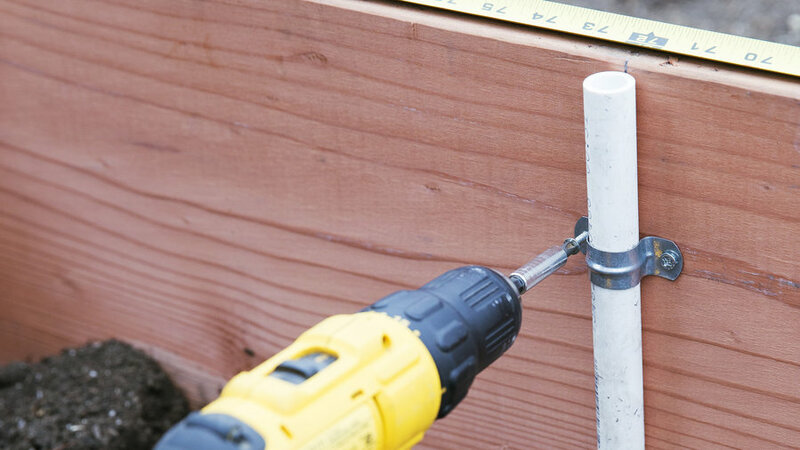 Here’s how: On the inside of each of the long (8-foot) sides of the raised bed, evenly space three of your 12-inch pieces of 1/2-inch PVC pipe. Set those pipes upright against the bed sides, making sure that each PVC pipe has a parallel pipe mirroring it across the bed (so each pair can act as support tubes for the hoops). 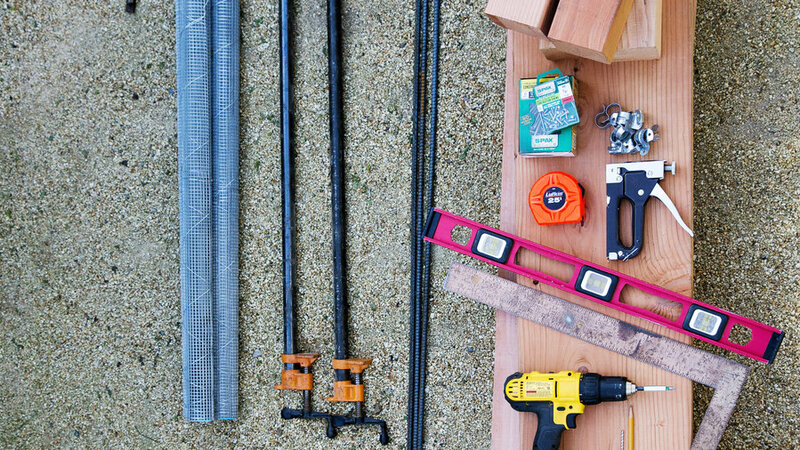 Secure each PVC pipe upright to the inside of the bed with two tube straps, using two 1/2-inch screws per strap. You don’t want to share your vegetables with gophers and moles. 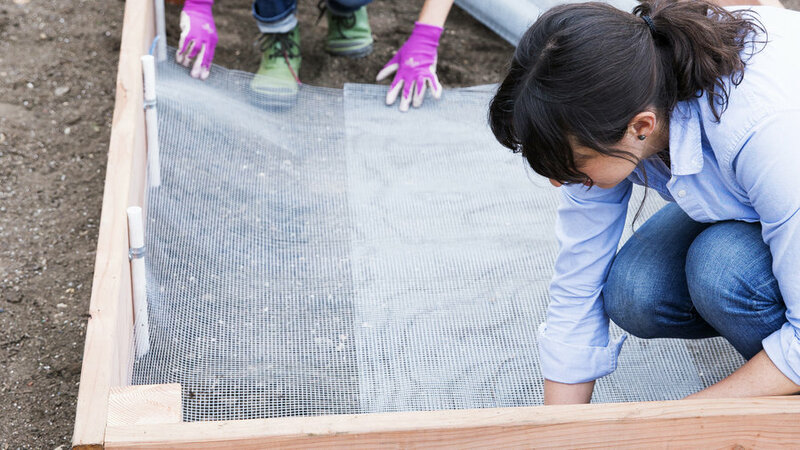 If they’re a problem in your area, keep them out of your raised bed by adding a layer of hardware cloth before you pour in your planting soil. Here’s what to do: Rake existing soil at the bottom of the bed to level it, then tamp it smooth. Wearing gloves, line the bed bottom with hardware cloth, making sure that the cloth is lying flat on the bottom and curving up to touch each side of the bed. Secure the cloth by stapling it to the sides of the bed. Use wire cutters to trim excess cloth and to help the cloth fit flush around the corner posts. 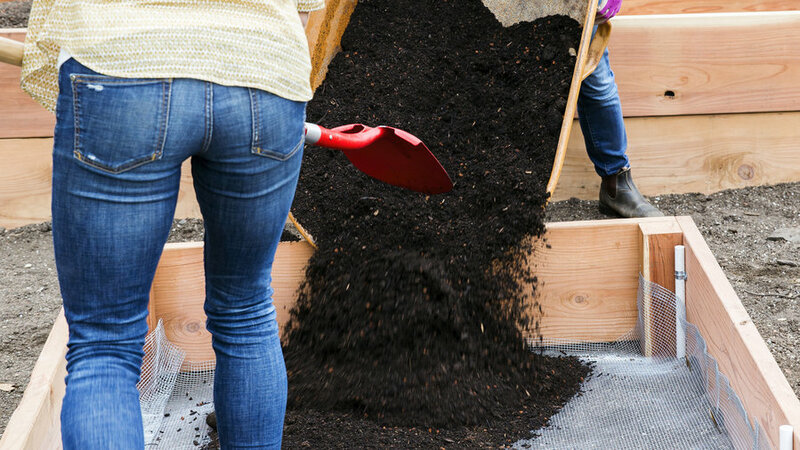 Fill the bed with a 50/50 mixture of planting soil and compost. (You can buy both in bags at a garden center, and you can typically save money by buying both in bulk at a local soil yard.) Once the bed is filled, rake the soil smooth and moisten it with a gentle spray from the hose. 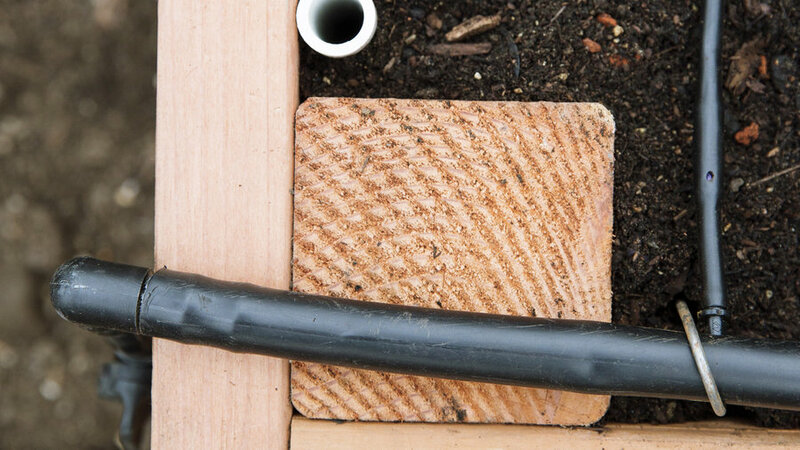 If you’ve got a drip system, simply connect this bed to your existing irrigation line. To cover our 4- by 8-foot bed evenly, we added 1/4-inch emitter lines (spaced every 12 inches) to 1/2-inch tubing. 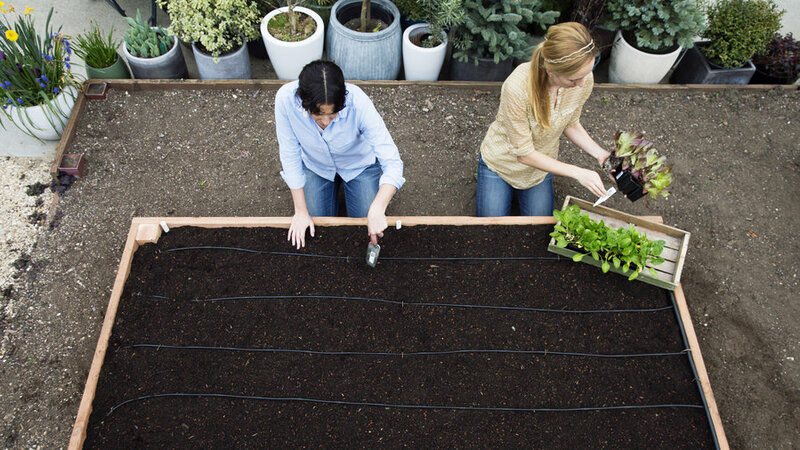 Your bed is ready to get growing with fruits, herbs, and vegetables. 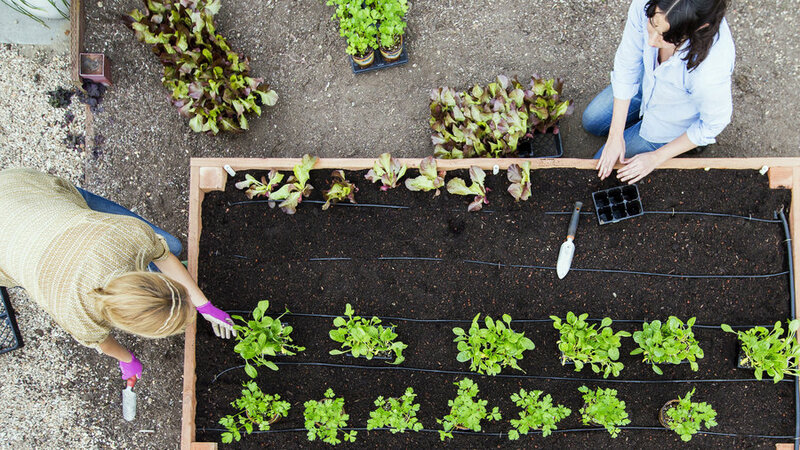 Learn where to start with our guide to growing an edible garden. To cover newly planted seedlings with bird netting or a season-extending floating row cover, add hoops to the PVC pipe supports in your bed. To form a hoop: Bend one of the 10-foot pieces of 3/8-gauge rebar so that it arcs into a half-circle, then slip each end of this hoop into a PVC pipe support. Repeat with remaining rebar to form and secure two more hoops. Then drape the bird netting or row cover over all three hoops.